"Brands are critical marketing assets, often as important to your success as your products themselves. Read what marketing leaders have to say about brands and branding, and learn how to develop for yourself the promise of a strong brand." Marketing is all about meeting the needs and wants of the customer. While this statement remains a fundamental truth, the reality is that the focus and direction of marketing activities has always changed with the times, the socio-political climate, and the prevalent culture. The content of this book was developed on the premise that revolutionary innovations begin with an idea that addresses a challenge, or a set of challenges, that we face today. It focuses on high level concepts that can be filtered down to accelerate and enhance the use of tools, tactics, and strategies that drive results. These pages show you how some of marketing's brightest stars seek to define the next big idea that will change the face of the industry. You will also gain insight into the role of dynamic marketing professionals who contribute to bringing these ideas to life. 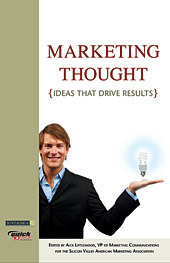 Much of the knowledge in this book was captured through SVAMA (Silicon Valley chapter of the American Marketing Association) initiatives, including the Marketing Thought conference conducted in May 2007. We hope it will help you to focus your marketing efforts and strategies to add value to your brands and organization. 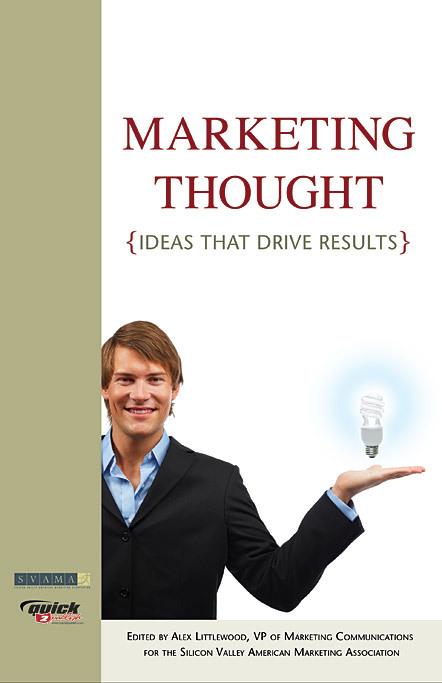 Quotes from "Marketing Thought: Tools, Tactics, and Strategies that Drive Results"
"Social media on the web--blogs, vlogs, podcasts, video games--is exploding. The image of the earth from afar transformed our understanding of the planet. Our understanding of markets and conversation is similarly developing. Control is so 20th Century"
"Mobilizing Advocates Online to Drive Dramatic Growth"
Where is the Marketing Leadership? How Do You Show Up As A Marketer? Alex Littlewood, is the ’07-’08 VP of Marketing communications for SVAMA, and works as a Project Manager at Liquid Agency, a brand strategy consulting and design agency in the Silicon Valley. In his professional career, Alex has worked with a wide range of world class brands including Intel, Adobe, Cisco, Intuit, Visa, Nestle, P&G, Clorox, and many more. Alex has a B.S. in Marketing and Finance from Cal Poly in San Luis Obispo, CA.